For other uses, see Carnegie Hall (disambiguation). Not to be confused with Carnegie Hill. Carnegie Hall (/kɑːrˈneɪɡi/ but more commonly /ˈkɑːrnɪɡi/) is a concert venue in Midtown Manhattan in New York City, United States, located at 881 Seventh Avenue, occupying the east side of Seventh Avenue between West 56th Street and West 57th Street, two blocks south of Central Park. Designed by architect William Burnet Tuthill and built by philanthropist Andrew Carnegie in 1891, it is one of the most prestigious venues in the world for both classical music and popular music. Carnegie Hall has its own artistic programming, development, and marketing departments, and presents about 250 performances each season. It is also rented out to performing groups. The hall has not had a resident company since 1962, when the New York Philharmonic moved to Lincoln Center's Philharmonic Hall (renamed Avery Fisher Hall in 1973 and David Geffen Hall in 2015). Carnegie Hall contains three distinct, separate performance spaces. The Isaac Stern Auditorium seats 2,804 on five levels and was named after violinist Isaac Stern in 1997 to recognize his efforts to save the hall from demolition in the 1960s. The hall is enormously high, and visitors to the top balcony must climb 137 steps. All but the top level can be reached by elevator. The main hall was home to the performances of the New York Philharmonic from 1892 until 1962. Known as the most prestigious concert stage in the U.S., almost all of the leading classical music and, more recently, popular music performers since 1891 have performed there. After years of heavy wear and tear, the hall was extensively renovated in 1986 (see below). The Ronald O. Perelman Stage is 42 feet deep. The five levels of seating in the Stern Auditorium begin with the Parquet level, which has twenty-five full rows of thirty-eight seats and four partial rows at stage level, for a total of 1,021 seats. The First Tier and Second Tier consist of sixty-five boxes; the First Tier has 264 seats at eight seats per box and the Second Tier seats 238, with boxes ranging from six to eight seats each. Second from the top is the Dress Circle, seating 444 in six rows; the first two rows form an almost-complete semicircle. At the top, the balcony seats 837. Although seats with obstructed views exist throughout the auditorium, only the Dress Circle level has structural columns. Zankel Hall, which seats 599, is named after Judy and Arthur Zankel. Originally called simply Recital Hall, this was the first auditorium to open to the public in April 1891. Following renovations made in 1896, it was renamed Carnegie Lyceum. It was leased to the American Academy of Dramatic Arts in 1898, converted into a cinema, which opened as the Carnegie Hall Cinema in May 1961 with the film White Nights by Luchino Visconti and was reclaimed for use as an auditorium in 1997. The completely reconstructed Zankel Hall is flexible in design and can be reconfigured in several different arrangements to suit the needs of the performers. It opened in September 2003. The 599 seats in Zankel Hall are arranged in two levels. The Parterre level seats a total of 463 and the Mezzanine level seats 136. Each level has a number of seats which are situated along the side walls, perpendicular to the stage. These seats are designated as boxes; there are 54 seats in six boxes on the Parterre level and 48 seats in four boxes on the Mezzanine level. The boxes on the Parterre level are raised above the level of the stage. Zankel Hall is accessible and its stage is 44 feet wide and 25 feet deep—the stage occupies approximately one fifth of the performance space. The Joan and Sanford I. Weill Recital Hall seats 268 and is named after Sanford I. Weill, a former chairman of the board, and his wife Joan. This auditorium, in use since the hall opened in 1891, was originally called Chamber Music Hall (later Carnegie Chamber Music Hall); the name was changed to Carnegie Recital Hall in the late 1940s, and finally became Joan and Sanford I. Weill Recital Hall in 1986. The Weill Recital Hall is the smallest of the three performance spaces, with a total of 268 seats. The Orchestra level contains fourteen rows of fourteen seats, a total of 196, and the Balcony level contains 72 seats in five rows. The building also contains the Carnegie Hall Archives, established in 1986, and the Rose Museum, which opened in 1991. Until 2009 studios above the Hall contained working spaces for artists in the performing and graphic arts including music, drama, dance, as well as architects, playwrights, literary agents, photographers and painters. The spaces were unusual in being purpose-designed for artistic work, with very high ceilings, skylights and large windows for natural light. In 2007 the Carnegie Hall Corporation announced plans to evict the 33 remaining studio residents, some of whom had been in the building since the 1950s, including celebrity portrait photographer Editta Sherman and fashion photographer Bill Cunningham. 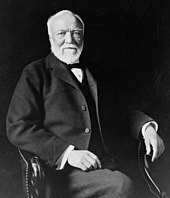 The organization's research showed that Andrew Carnegie had always considered the spaces as a source of income to support the hall and its activities. The space has been re-purposed for music education and corporate offices. Carnegie Hall is one of the last large buildings in New York built entirely of masonry, without a steel frame; however, when several flights of studio spaces were added to the building near the turn of the 20th century, a steel framework was erected around segments of the building. The exterior is rendered in narrow Roman bricks of a mellow ochre hue, with details in terracotta and brownstone. The foyer avoids typical 19th century Baroque theatrical style with the Florentine Renaissance manner of Filippo Brunelleschi's Pazzi Chapel: white plaster and gray stone form a harmonious system of round-headed arched openings and Corinthian pilasters that support an unbroken cornice, with round-headed lunettes above it, under a vaulted ceiling. The famous white and gold auditorium interior is similarly restrained. The firm of Adler & Sullivan of Chicago, noted for the acoustics of their theaters, were hired as consultant architects though their contributions are not known. Carnegie Hall is named after Andrew Carnegie, who funded its construction. It was intended as a venue for the Oratorio Society of New York and the New York Symphony Society, on whose boards Carnegie served. Construction began in 1890, and was carried out by Isaac A. Hopper and Company. Although the building was in use from April 1891, the official opening night was May 5, with a concert conducted by maestro Walter Damrosch and great Russian composer Pyotr Ilyich Tchaikovsky. Originally known simply as "Music Hall" (the words "Music Hall founded by Andrew Carnegie" still appear on the façade above the marquee), the hall was renamed Carnegie Hall in 1893 after board members of the Music Hall Company of New York (the hall's original governing body) persuaded Carnegie to allow the use of his name. Several alterations were made to the building between 1893 and 1896, including the addition of two towers of artists' studios, and alterations to the smaller auditorium on the building's lower level. The hall was owned by the Carnegie family until 1925, when Carnegie's widow sold it to a real estate developer, Robert E. Simon. When Simon died in 1935, his son, Robert E. Simon, Jr., became owner. By the mid-1950s, changes in the music business prompted Simon to offer Carnegie Hall for sale to the New York Philharmonic, which booked a majority of the hall's concert dates each year. The orchestra declined, since it planned to move to Lincoln Center, then in the early stages of planning. At the time, it was widely believed that New York City could not support two major concert venues. Facing the loss of the hall's primary tenant, Simon was forced to offer the building for sale. A deal with a commercial developer fell through, and by 1960, with the New York Philharmonic on the move to Lincoln Center, the building was slated for demolition to make way for a commercial skyscraper. Under pressure from a group led by violinist Isaac Stern and many of the artist residents, special legislation was passed that allowed the City of New York to buy the site from Simon for $5 million (which he would use to establish Reston, VA), and in May 1960 the nonprofit Carnegie Hall Corporation was created to run the venue. It was designated a National Historic Landmark in 1962. Most of the greatest performers of classical music since the time Carnegie Hall was built have performed in the Main Hall, and its lobbies are adorned with signed portraits and memorabilia. The NBC Symphony Orchestra, conducted by Arturo Toscanini, frequently recorded in the Main Hall for RCA Victor. On November 14, 1943, the 25-year old Leonard Bernstein had his major conducting debut when he had to substitute for a suddenly ill Bruno Walter in a concert that was broadcast by CBS, making him instantly famous. In the fall of 1950, the orchestra's weekly broadcast concerts were moved there until the orchestra disbanded in 1954. Several of the concerts were televised by NBC, preserved on kinescopes, and have been released on home video. 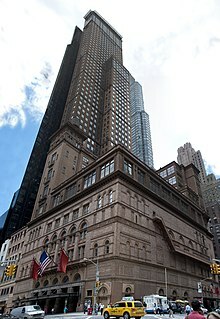 Many legendary jazz and popular music performers have also given memorable performances at Carnegie Hall including Benny Goodman, Duke Ellington, Glenn Miller, Billie Holiday, Billy Eckstine, the Dave Brubeck Quartet, Violetta Villas, Judy Garland, Harry Belafonte, Charles Aznavour, Ike & Tina Turner, Paul Robeson, Nina Simone, Shirley Bassey, James Gang and Stevie Ray Vaughan, all of whom made celebrated live recordings of their concerts there. The hall has also been the site of many famous lectures, including the Tuskegee Institute Silver Anniversary Lecture by Booker T. Washington, and the last public lecture by Mark Twain, both in 1906. Sissieretta Jones became the first African-American to sing at the Music Hall (renamed Carnegie Hall the following year), June 15, 1892. The Benny Goodman Orchestra gave a sold-out swing and jazz concert January 16, 1938. The bill also featured, among other guest performers, Count Basie and members of Duke Ellington's orchestra. Rock and roll music first came to Carnegie Hall when Bill Haley & His Comets appeared in a variety benefit concert on May 6, 1955. Rock acts were not regularly booked at the Hall however, until February 12, 1964, when The Beatles performed two shows during their historic first trip to the United States. Promoter Sid Bernstein convinced Carnegie officials that allowing a Beatles concert at the venue "would further international understanding" between the United States and Great Britain. "Led Zeppelin became the first hard rock act to play Carnegie Hall since the Rolling Stones tore the place up some five years ago." Two concerts were performed October 17, 1969. Since then numerous rock, blues, jazz and country performers have appeared at the hall every season. Jethro Tull released the tapes recorded on its presentation in a 1970 Benefit concert, in the 2010 re-release of the Stand Up album. Ike & Tina Turner performed a concert April 1, 1971, which resulted in their album What You Hear is What You Get. The Beach Boys played concerts in 1971 and 1972, and two songs from the show appeared on their Endless Harmony Soundtrack. Chicago recorded its 4-LP box set Chicago at Carnegie Hall in 1971. The building was extensively renovated in 1986 and 2003, by James Polshek, who became better known through his post-modern planetarium at the American Museum of Natural History. Polshek and his firm, Polshek Partnership, were involved since 1978 in four phases of the Hall's renovation and expansion including the creation of a Master Plan in 1980; the actual renovation of the main hall, the Stern Auditorium, and the creation of the Weill Recital Hall and Kaplan Rehearsal Space, all in 1986; the creation of the Rose Museum, East Room and Club Room (later renamed Rohatyn Room and Shorin Club Room, respectively), all in 1991; and, most recently, the creation of Zankel Hall in 2003. In 1987–1989, a 60-floor office tower, named Carnegie Hall Tower, designed by César Pelli & Associates, was completed next to the hall on the same block. New backstage space and banquet spaces, contained within the tower, connect with the main Carnegie Hall building. In June 2003, tentative plans were made for the Philharmonic to return to Carnegie Hall beginning in 2006, and for the orchestra to merge its business operations with those of the venue. However, the two groups abandoned these plans later in 2003. In 2014, Carnegie Hall opened its Judith and Burton Resnick Education Wing, which houses 24 music rooms, one of which is large enough to hold an orchestra or a chorus. The $230 million project was funded with gifts from Joan and Sanford I. Weill and the Weill Family Fund, Judith and Burton Resnick, Lily Safra and other donors, as well as $52.2 million from the city, $11 million from the state and $56.5 million from bonds issued through the Trust for Cultural Resources of the City of New York. Since July 2005, the Executive and Artistic Director of Carnegie Hall is Sir Clive Gillinson, formerly managing director of the London Symphony Orchestra. Unexpectedly, for most concert-goers, it emerged in 1986 that Carnegie Hall had never consistently maintained an archive. Without a central repository, a significant portion of Carnegie Hall's documented history had been dispersed. In preparation for the celebration of Carnegie Hall's centennial in 1991, the management established the Carnegie Hall Archives. This old joke has become part of the folklore of the hall, but its origins remain a mystery. According to The New York Times, the main player in the story has been described at various times as either an unnamed man, violinist Jascha Heifetz or the pianist Arthur Rubinstein. On its webpage, Carnegie Hall quotes the wife of violinist Mischa Elman as having perhaps the best story of its origin: "One day, after a rehearsal that hadn’t pleased Elman, the couple was leaving Carnegie Hall by the backstage entrance when they were approached by two tourists looking for the hall’s entrance. Seeing his violin case, they asked, 'How do you get to Carnegie Hall?' Without looking up and continuing on his way, Elman simply replied, 'Practice.'" The hall's operating budget for the 2008–2009 season was $84 million. For 2007–2008, operating costs exceeded revenues from operations by $40.2 million. With funding from donors, investment income and government grants, the hall ended that season with $1.9 million more in total revenues than total costs. Several other concert halls also bear the Carnegie name. Carnegie Hall, a 540-seat venue in Andrew Carnegie's native Dunfermline, Scotland, opened in 1937. 420-seat Carnegie Hall in Lewisburg, West Virginia. Carnegie Library and Theatre in Covington, Kentucky. 1928-seat Carnegie Music Hall on the main site of the Carnegie Museums of Pittsburgh and the main branch of the Carnegie Library of Pittsburgh. Carnegie Hall on the North Side of Pittsburgh, formerly known as Allegheny, Pennsylvania, attached to the Carnegie Library. Carnegie Music Hall attached to the Carnegie library in the suburb of Braddock, Pennsylvania. This was built as part of an 1893 addition to the Braddock Carnegie Library. As of April 2014, it is undergoing restoration. 1,022-seat Carnegie Music Hall annexed to the Carnegie library in the suburb of Homestead, Pennsylvania. Carnegie Music Hall attached to the Carnegie library in the suburb of Carnegie, Pennsylvania. Carnegie also built a Library and Music Hall in the suburb of Duquesne, Pennsylvania that was demolished in 1968. ^ a b "Carnegie Hall". National Historic Landmark summary listing. National Park Service. September 9, 2007. Archived from the original on November 6, 2007. ^ Although Andrew Carnegie pronounced his name with the stress on the second syllable, the building is generally pronounced with the stress on the first syllable. ^ Thomasini, Anthony (September 25, 2015). "Music: Lang Lang opens Philharmonic Season as Avery Fisher Hall is Renamed". The New York Times. Retrieved December 25, 2015. ^ "The A to Z of Carnegie Hall: S is for Stern". Carnegie Hall. September 23, 2013. Retrieved November 14, 2014. ^ "Information: Accessibility". Carnegie Hall. Retrieved November 14, 2014. ^ Carnegie Hall. "Stern Auditorium-Perelman Stage Rentals". Retrieved May 5, 2015. ^ a b Dunlap, David W. (January 30, 2000). "Carnegie Hall Grows the Only Way It Can; Burrowing Into Bedrock, Crews Carve Out a New Auditorium". The New York Times. Retrieved November 14, 2014. ^ a b Muschamp, Herbert (September 12, 2003). "Architecture Review; Zankel Hall, Carnegie's Buried Treasure". The New York Times. Retrieved November 14, 2014. ^ Carnegie Hall. "Zankel Hall Rental". Retrieved May 5, 2015. ^ Carnegie Hall. "Weill Recital Hall". Retrieved May 5, 2015. ^ Goodman, Wendy (December 30, 2007). "Great Rooms: Bohemia in Midtown". New York. Retrieved November 14, 2014. ^ Pressler, Jessica (October 20, 2008). "Editta Sherman, 96-Year-Old Squatter". New York. Retrieved November 14, 2014. ^ "Tchaikovsky in America". Carnegie Hall official website. Retrieved September 5, 2017. ^ "1891 Andrew Carnegie's new Music Hall opens". Archived from the original on May 28, 2016. Retrieved September 5, 2017. ^ Greenwood, Richard (May 30, 1975). 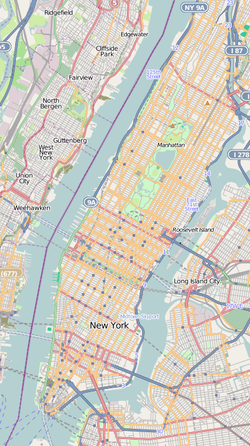 "National Register of Historic Places Inventory: Carnegie Hall". National Park Service. Retrieved November 14, 2014. ^ "National Register of Historic Places Inventory: Carnegie Hall—Accompanying Photos". National Park Service. May 30, 1975. Retrieved November 14, 2014. ^ Lee, Maureen D. (May 2012). Sissierettta Jones, "The Greatest Singer of Her Race," 1868–1933. University of South Carolina Press. ^ Hudson, Rob. "From Opera, Minstrelsy and Ragtime to Social Justice: An Overview of African American Performers at Carnegie Hall, 1892–1943". The Black Past: Remembered and Reclaimed. Retrieved November 14, 2014. ^ "Stars assist the blind" (PDF). The New York Times. May 7, 1955. Retrieved November 14, 2014. ^ "The Beatles at Carnegie Hall". It All Happened – A Living History of Live Music. ^ Wilson, John S. (February 13, 1964). "2,900-Voice Chorus Joins The Beatles" (PDF). The New York Times. Retrieved November 14, 2014. ^ Schaffner, Nicholas (July 1977). The Beatles Forever. New York: Fine Communications. p. 14. ISBN 978-1567310085. ^ "October 17, 1969, New York, NY US". Led Zeppelin Timeline. ledzeppelin.com. October 17, 1969. Retrieved December 25, 2015. ^ "This installment of our A to Z of Carnegie Hall series looks at the letter R—for "Rock '". The A to Z of Carnegie Hall: R is for Rock 'n' Roll. September 22, 2012. Retrieved December 25, 2015. ^ "History of the Hall: Timeline—1986 Full interior renovation completed". Carnegie Hall. Retrieved November 14, 2014. ^ Walsh, Michael (February 16, 1987). "Sounds in the night". Time. 129 (7). ^ Kozinn, Alan (September 14, 1995). "A Phantom Exposed: Concrete at Carnegie". The New York Times. Retrieved November 14, 2014. ^ "N.Y. Philharmonic, Carnegie Merger Off". Billboard. Associated Press. October 8, 2003. Retrieved November 14, 2014. ^ Cooper, Michael (September 12, 2014). "Carnegie Hall Makes Room for Future Stars: Resnick Education Wing Prepares to Open at Carnegie Hall". The New York Times. Retrieved November 14, 2014. ^ Cerf, Bennett (1956). The Life of the Party: A New Collection of Stories and Anecdotes. Garden City, New York: Doubleday. p. 335. ^ Pollak, Michael (November 29, 2009). "The Origins of That Famous Carnegie Hall Joke". The New York Times. ^ "History FAQ: Who created the "How do you get to Carnegie Hall?" joke?". Carnegie Hall. Retrieved November 14, 2014. Richard Schickel, The World of Carnegie Hall, 1960. Wikimedia Commons has media related to Carnegie Hall.